Many seasoned heads from across the world have been banging against Afghanistan’s hard narcotics wall. Only these heads have suffered. Not the Taleban, who continue to profit from opium production. As they had done when they were supported by the US in the 90s and till that craven appreciation was given to them for supposedly banning opium production in early 2001. After 9/11 the Taleban were in disgrace and dumped. Not all of them. Old ties still bound the US policy makers to some of the Taleban and Mujahideen. These rogue elements were accommodated in the new administration headed by Karzai, an ex-Taleban himself. That is the reason why the too optimistic clamour for victory has now been replaced by a resigned acceptance of the stench of collusion. That is why narcotics, which funds the Taleban, is here to stay. Despite UNODC publishing inaccurate, self advancing, self deluding and self congratulatory reports giving the impression that all is well and under control. This year they have shown a 20% decline in opium poppy production, which they attribute to their efforts. It is not so. It is because of bad weather that Afghanistan produced less opium this year. Their methodology, which has always been vague, is not given in the 2009 Afghanistan Report. The UNODC experts are silent about error margins too. They and others are repeating the mistakes of 2001 when they allowed oil politics (the UNODC Chief Mr. Pino Arlachi had most unusually met American oil executives on several occasions in 200 and 2001) to give a certificate of merit to the Taleban for not growing opium. This was the Occidental driven campaign to give a clean chit to the Taleban so that a pipeline could bring gas cheaply from Tukmenistan, through Western Afghanistan, to Pakistan and then to the recipient countries. This was the inspiration behind the sly move to give the Taleban a clean chit. Otherwise, it would have been impossible for these countries to have even the thought of dealing with the repugnant Taleban accepted by their citizens. They had forgotten at that time that there were other objectionable things about the horrid Taleban like women bashing, mutilating and murder. However, its Narcotics that I will stick to. Today’s narcs headache is because of the earlier shoddy conciliatory policies followed by the Western powers that encouraged this explosion of opium production in that blighted country. During the end years of the maligned Najibullah Government in Afghanistan only 10,000 hectares were under opium poppy cultivation in 1986. This means an anticipated production of about 300 tons at most as at that time the yield per hectare was not very high. Then, as Najibullah’s hold weakened and that of the US and Pakistan fed, armed and financed Mujahideen and the Taleban became stronger opium production increased. In 1987 it was 25,000 hectares. In 1988 it was 32,000 and in 1989 by when Najibullah had been overthrown it was 34,300. The next year it was 41,300 and it continued to shoot up till 2000 when it was 82,171 hectares. By this time Afghanistan was infested with the Taleban and crawling with their foreign financiers and supporters. In this disgraceful period of collusion the US had coaxed the DEA to reduce their staff in Pakistan by 80% or so leaving only a skeleton of about ten persons. The DEA was the only department in the US Government capable of doing its job sincerely, and thus it was threat. It was the US policy at that time to make opium pay for the war against Najibullah, and afterwards to reward the Taleban by allowing it to keep its growing profits. By now the public opinion in the US was hardening against the bestial and barbarous Taleban. It would have been revolted at any truck with them. Something had to be done to remake their image. Taleban delegations were entertained in America repeatedly. They were convinced by bribery to at least say that they were against opium production. So lo and behold in 2001 only 7606 hectares were said to have been cultivated with opium poppy. But, is it true? Thousands of journalists, experts, diplomats, soldiers and know-alls willingly suspended their disbelief and accepted this preposterous assertion certified by a UN led team of eight nations (including Pakistan) that visited one area in Nangarhar and another elsewhere in March of 2001. Every one had collectively ignored the hard reality that in 2001 an extremely severe drought had damaged not only opium but also other crops as well in the entire region stretching from Afghanistan through Pakistan and India till Myanmar and Thailand. Opium production in all these areas had been severely hurt. 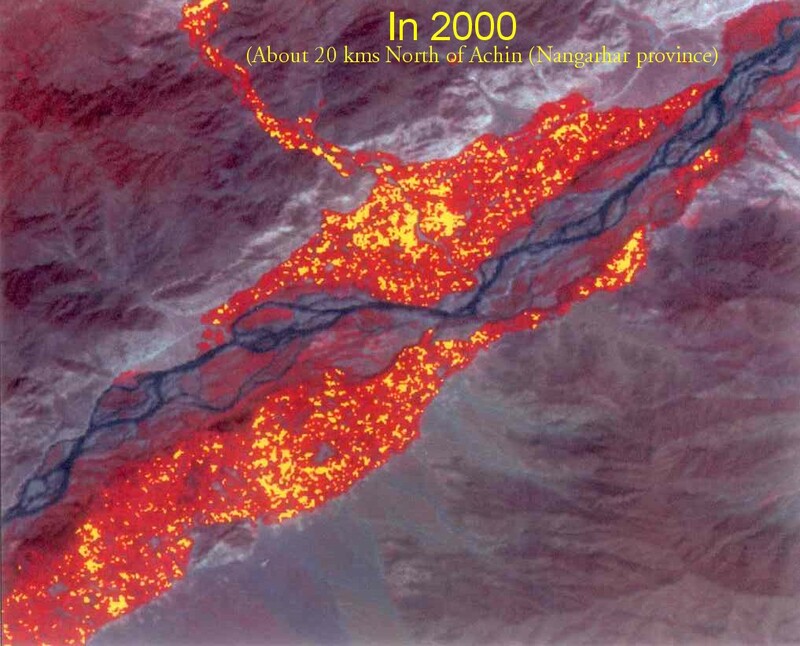 During 2000 and 2001 Indian satellites had been surveying the opium fields in Afghanistan. There is a 30% margin of error in their observations but yet they reveal a contradictory picture. According to these pictures opium had been sown but in areas where there was very severe drought the crop had been irretrievably damaged. In some parts of Nangarhar (Achin for instance) the crop had not suffered too much. However, the UN team had been taken to the NE of Nangarhar. The eight satellite pictures reproduced above show opium poppy fields in 200 and 2001. It shows the existence (+ or – error of 30% notwithstanding) of larger tracts of opium poppy than had been accepted earlier. The yellow blobs show opium cultivation. In case of Zamindwar there was more opium produced in 2001- the year that the clean chit was given to the Taleban- than in 2000! 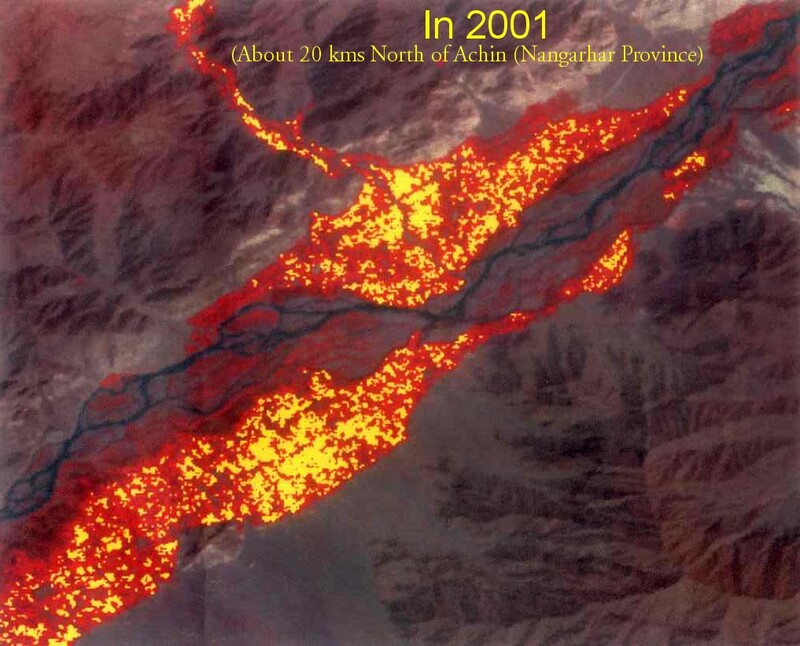 These pictures, taken by Indian satellites in 2000 & 2001, will have many skeptics. That will be good. Nothing like a logical discussion. My idea that the 2001 "ban" was an eye wash is strengthened by the tables given below. 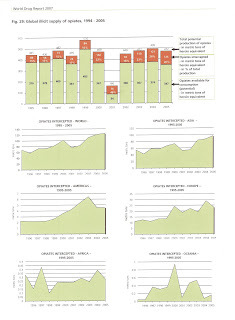 The first one shows a tremendous decline in opium production for 2001. The years before and after it have high production. It is IMPOSSIBLE for a ban, even if it is by the cruel Taleban, to be imposed so quickly over such a vast territory with such little communication. In India illicit opium cultivation has been banned for 60 years and yet, despite excellent communications and efficient enforcement agencies, it has been impossible to show more than marginal success. How could the Taleban, in one year and ONLY for that ONE year, achieve a reduction by about 30%!!! And in the years following 2001 with so many arms and men even a 5% reduction in illicit cultivation is thought to be marvellous. Misquoting the Stoic poet Cleanthes' Hymn to Zeus, I can only say " Master of the bright thunderbolt, save (these UN, NATO, UK and US) men from painful ignorance." And yet the UN team of eight countries that was taken only to a corner of Nangarhar in March 2001 verified from that one corner that opium cultivation in all of Afghanistan had come down drastically. If it had it was because of the severe draught. Not because of the Taleban. In the subsequent seizure tables I was surprised to find that there was no corresponding decrease of opiates at all. Why not? The reason is simple. Opium had been produced despite the so called Taleban ban and certified by a desperate West, but it was less because of the drought. The US had bent over backwards to appease the Mujahideen first and then the Taleban. After 9/11 though the US and NATO troops occupied Kabul and some areas their victory has never been complete. One reason is that some of the Taleban and Mujahideen, whom they had supported before 9/11, are still their trusted aides. They are in every form of governance in Afghanistan , which is verily a theatre of the absurd. How can these advisers, monkeys’ paws etc suddenly turn over a new leaf and abide by new rules? Impossible. If you sup with the Devil once he will not let you go. Such people will never report the truth or give the correct advice. If the inputs are all wrong it will be impossible to take the right decisions. And that is what is happening. On top of that there is enormous corruption everywhere, especially amongst the very same people who have led charmed lives from the 90s just because they were close to Pakistani and US officials. The present administration in Afghanistan is busy, as far as Narcotics is concerned, in trying to live with the criminals of the past. It can not disown them for then many scandals will emerge. That is why it is safe to spend more than a billion US $ every year and line many private pockets and groan and moan, helplessly and sanctimoniously about expanding opium production. They will not look at this problem objectively and rationally. There is at least one alternative, which could spell hope, but that has been deliberately reviled. I refer to the Poppy for Medicine proposal which suggests legalizing opium cultivation with the help of the village councils themselves. Unless a clean break with the past has been made and earlier errors accepted it will be impossible to work solve the Narcotics tangle that Afghanistan is mired in.